Miles Teller is one lucky man. The 27-year-old who tormented us with his intensely brilliant jazz drumming last night, at the London premiere of Whiplash, almost died seven years ago in a horrific car accident. Left with blatant scars across his face and neck, the talented musician had been with his friends when their car rolled (actually flipped eight times) before he flew out of the car window. Unconscious and covered in blood, his friends thought he was dead. 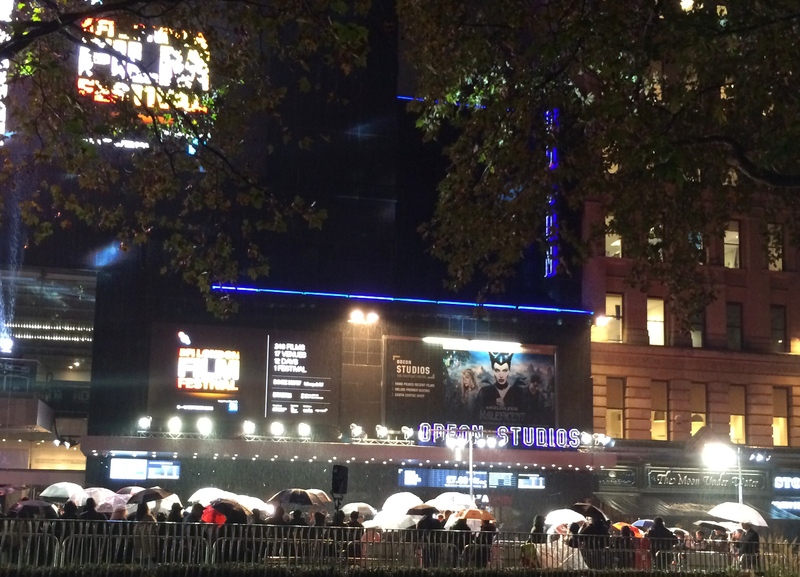 spot the red carpet umbrellas.. never a London premiere without a full-on down pour! This story only adds even more drama to Damien Chazelle’s film. Focusing on the intense relationship between Andrew Neyman (Miles Teller), a super-talented young jazz drummer at a prestigious music college, and Terence Fletcher (JK Simmons), his brilliant but extremely torturous teacher, Whiplash is quite a masterpiece. In fact, as the film develops, Fletcher is no less than sadistic. His tyrannical music sessions are breathtaking to observe (I literally couldn’t breathe) as you wait for his explosions to occur. Chazelle, himself, was an aspiring drummer and the film echoes some of his own experiences. It has already won the Grand Jury and the Audience awards at this year’s Sundance Festival and Simmons is tipped as a hot Oscar favourite for his portrayal of Fletcher. But it’s Miles Teller who gets my vote. His astounding performance struck such a chord (excuse the pun) with me as I often wonder how destructive ambition can prove to be. But then maybe Teller has already shown us that he is somewhat indestructible?